Camcorder maintenance is essential for consistent high quality recording and playback. 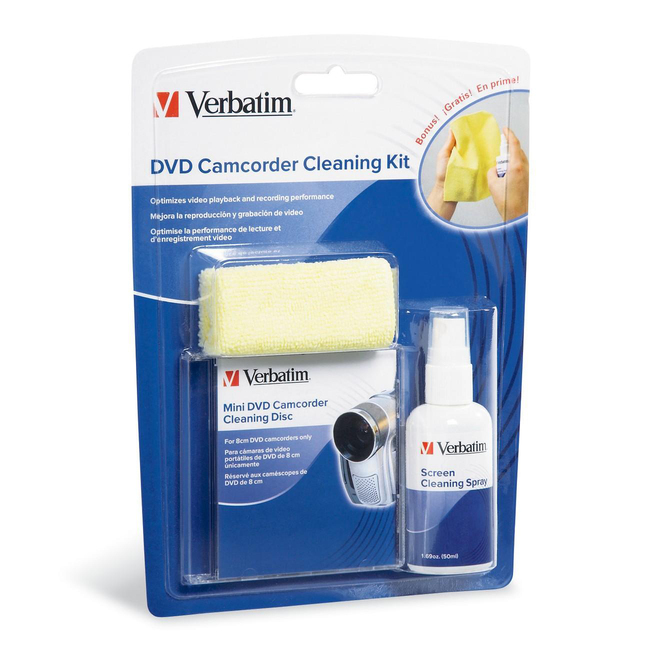 Verbatim's DVD Camcorder Cleaning Kit eliminates dust and dirt buildup that can collect on the camcorder lens. With each use, the multi-brush cleaning system safely and effectively removes particles from the lens allowing clear sound and image recording. Simply insert the cleaning disc into your camcorder and press play to start the cleaning process, within seconds the cleaning process is complete. As a bonus with the purchase of a DVD Camcorder Cleaning Kit, a Screen Cleaning Kit has been included. Each kit includes one re-usable towel with a non-alcohol solution for cleaning computer monitors and television screens.